FILE - A police officer talks to men in a street in Kashgar, Xinjiang Uighur Autonomous Region, China, March 24, 2017. Just a few weeks before China’s human rights record comes up for periodic review at the United Nations, the country’s leadership is putting itself squarely behind a massive effort to detain and indoctrinate Muslims in its western region of Xinjiang. The message from state media reports, editorials, an interview with Xinjiang’s top official as well as a polished and lengthy propaganda film of what China calls “vocational education centers” has been clear. ​The effort was needed to stem the spread of religious extremism and to stop a surge in “terrorist” attacks, according to the chairman of Xinjiang’s government Shohrat Zakir. The propaganda video says thousands of attacks have been carried out in recent years before the program was put into place. 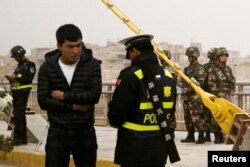 How many attacks took place is unclear, but that would’ve put Xinjiang on par with Afghanistan, analysts note. And while China is unlikely to change the minds of any Western elites or rights advocates, the target audience of its offensive is more those in the developing world, analysts note. For months, Beijing has denied the existence of the centers, which analysts say authorities started to put in place in April 2017. However, it wasn’t until August of this year, when China faced a United Nations panel on the Convention on the Elimination of All Forms of Racial Discrimination that it admitted the existence of the centers. What is surprising is that Beijing waited this long, said James Leibold, a Xinjiang specialist at LaTrobe University in Melbourne. “I can’t help but think that it is an effort to avert further embarrassment internationally at the U.N. and as you know U.S.-China relations have really soured and I think they feel they have to kind of respond to some of this criticism that is coming, particularly out of DC,” he said. From Weibo, a Chinese microblogging site, the translation of a post: Old Li Fei Three Knives: [China is] paying lip service to try to win over the world. ​Despite Beijing’s clarifications, much remains unclear. For example, the number of centers that actually exist and how many have been detained. Critics and rights groups estimate that hundreds of thousands, perhaps more than one million people, have been sent to the centers. What is also unclear is how long the training lasts and whether or not individuals come voluntarily as the government claims or not. From Weibo, a Chinese microblogging site, the translation of a post: Tomorrow is Yesterday's Race to the Ends of the Earth: There are already more than 40,000 mosque there. Even if you can bring them under control now (really? ), that doesn't mean that it won't get out of control in the future. Xijiang’s chairman Shohrat Zakir has said the trainees who come to the centers do so voluntarily. But Hu Xijin, editor in chief of the party backed tabloid, the Global Times, shared a different view on Twitter. “I don’t think trainees of vocational training centers in Xinjiang go there voluntarily, but they have been given sincere help of education and training to enable them to return to normal life eventually,” he wrote. How the United Nations review will go towards answering some of those questions or pressuring China to scrap the “internment camps”, as rights groups are advocating, is uncertain. Analysts note China is working aggressively to advance its view on human rights at the United Nations. That view includes putting a higher priority on stability, economic development and the state over individual rights. The motion called for “mutually beneficial co-operation in the field of human rights” and stressed respect for each country’s interpretation of the concept. Dilxat Raxit, spokesman for the German-based World Uyghur Congress, is calling for an end to the camps and at the very least independent press access. He expressed both confidence that China’s move would backfire, but also concern that countries in Beijing’s pockets would support it during the review. “China has successfully kidnapped the U.N.’s Human Rights Council and used economic benefits to control it or drive a wedge [between members.] To a certain degree, the UN has been divided and kidnapped by those autocratic member countries, led by China,” Raxit said. China’s Universal Periodic Review begins on November 6 in Geneva Switzerland, where groups such as Raxit’s World Uyghur Congress and others are expected to stage large protests.